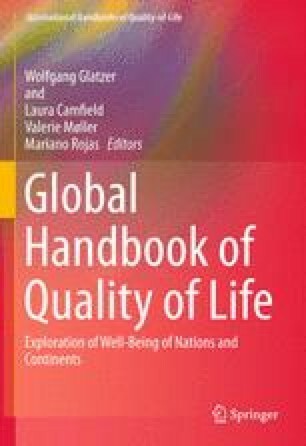 This chapter examines various dimensions of quality of life in Europe, using results from the European Quality of Life Survey. The third wave of this survey was carried out in all 28 European Union Member States as well as in 6 other countries from autumn 2011 to early 2012. In total, over 43,000 people aged 18 and over residing in these countries were interviewed. Presenting findings from the latest EQLS survey, the chapter looks at subjective wellbeing in detail, while more briefly reporting on living standards and deprivation, work, private life, and work-life balance, home, housing and local environment, public services, healthcare and health and quality of society. Specific attention is given to developments since the previous EQLS survey, fielded in 2007, to assess the impact of the crisis on the quality of life of Europeans. With rising social inequalities in Europe, the chapter provides an impression of the real impact of the crisis on people’s lives and shows who has been hit hardest. For the life satisfaction scale, Abdallah and colleagues calculated the mean for quintiles (Eurofound 2013e). Since there are only 10 possible responses on the life satisfaction scale, it is rarely the case that response categories fit neatly into 20 % bands. For example, if 15 % of respondents respond 1–5, and 10 % respond 6, then the mean life satisfaction of the bottom quintile needs to be the average of those responding 1–5 and half of those responding 6. Q30 – All things considered, how satisfied would you say you are with your life these days? Q41 – Taking all things together, how happy would you say you are? Therefore, to calculate the mean, all respondents in each country were ordered by life satisfaction. Respondents with the same life satisfaction scores were ranked randomly. The rank function was used in SPSS to assign respondents into equally sized quintiles for each country. This was done with within-country weightings. In this way, all the quintiles for each country had the same N + −1. Mean life satisfaction scores were then calculated for each quintile for each country. The mean pair distance is a measure of inequality within a population. For any given variable (for example life satisfaction), it is the average difference between two randomly selected people within the population. It can be calculated with a basic frequency table, simply working out all the differences between each pair of respondents, summing them all up, and dividing that by the number of possible combinations of respondents. As is mentioned in section “Life Satisfaction Inequalities”, it is related to the Gini coefficient, which is widely used with income distributions. To calculate the mean pair distance from the Gini coefficient, one must simply multiply the Gini by twice the mean of the population. So if the Gini coefficient of income for a country is 0.3, and the mean income is €15,000, then the mean pair distance is €9,000. That means that if any two people in the population are selected, the average difference in income between them would be €9,000. As discussed in Abdallah (2012), the mean pair distance is more appropriate for a measure such as life satisfaction because it is not a ratio measure. It is meaningful to say that €400 is twice as much as €200, but it is not meaningful to say that a life satisfaction score of 4 is twice as much as 2. At Fig.脉29.10, the mean domain satisfaction was entered into a regression, together with the difference variables (e.g. difference between family life satisfaction and mean domain satisfaction). The effect size is the change in life satisfaction associated with a one-point difference in the independent variable in question, based on a linear regression model. So, an increase in satisfaction with social life of one point is associated with an increase in life satisfaction of 0.6 points. At Fig.脉29.27, using multilevel analysis with grand mean centering, the model takes into account the individual and country-related factors that determine trust in institutions (which is the average of responses to items Q28 a., b., d., e. and f.). The dependent variable is the level of trust in institutions. Using grand mean centering techniques for the explanatory variables, the estimated effect of an explanatory variable raises or lowers the level of trust in institutions. See Eurofound 2013a, p. 70 for more information. Each of the items has six-scale answering categories, ranging from ‘all of the time’ (0) to ‘at no time’ (5). The joint scores to these 4 questions can thus amount to a maximum of 20, which is then multiplied by 5 to get to a maximum of 100. The higher the score on the index, which goes from 0 to 100, the better is a person’s hedonic wellbeing. Each of the items has six-scale answering categories, ranging from ‘all of the time’ (0) to ‘at no time’ (5). The joint scores to these five questions can thus amount to a maximum of twenty five, which is then multiplied by four to get to a maximum of hundred. The higher the score on the index, which goes from 0 to 100, the better is a person’s mental wellbeing. Scores on the perceived social exclusion index are the average total scores of the four statements, where 1 = ‘strongly disagree’ and 5 = ‘strongly agree’. Eurostat. (2013). Quality of life indicators. http://epp.eurostat.ec.europa.eu/portal/page/portal/quality_life/introduction. Accessed 23 Sept 2013. Helliwell, J., et al. (2013a). World happiness report. http://unsdsn.org/files/2013/09/WorldHappinessReport2013_online.pdf. Accessed 12 Sept 2013.